The plot below shows the tidal water levels for the Goolwa Channel downstream of the barrage for the last few days over the storm period (similar plots and levels were recorded elsewhere in the vicinity of the mouth apart from a couple which need maintenance). Note how the recorded minimums increased by about 0.5m due to barometric change (maybe about 0.2m) and associated winds and ocean swells whereas the predicted astronomical minimums were steady of if anything in the opposite direction. The maximum water level on October 1 was about 1.1m, below our recently recorded max in July of 1.4m but sufficient to just reach the road below the barrage. Because the various barrages were only about 5% open the volume of seawater entering the Lower Lakes was restricted but salinities upstream of Ewe and Tauwitcherie did reach 35,000 EC for up to 4 days. We know last time in May it took about 24 hrs for salty water to reach Point Sturt but have no info this time because of station closure. 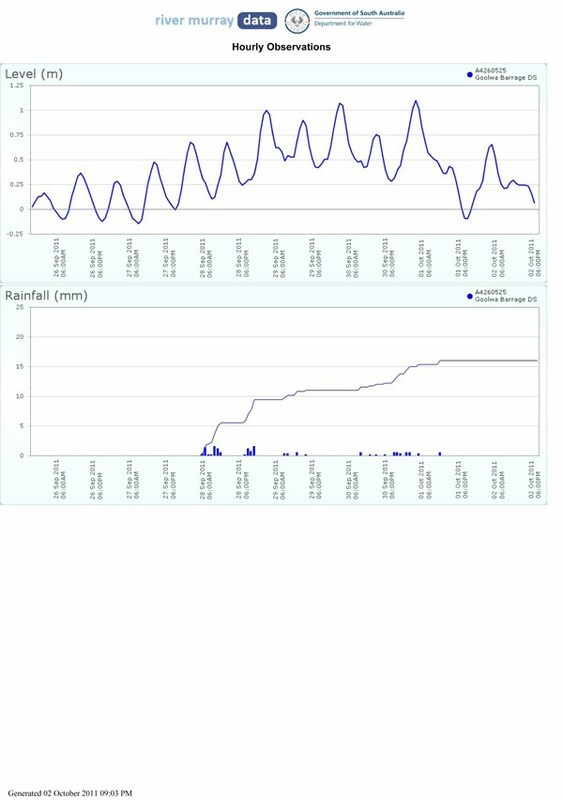 The quick change in wind direction from SW to E have seen water levels in the Goolwa area change from about 0.4m AHD to 0.9m today. Of no great significance except to add credence to Sturt's descriptions of his journey. At first he had trouble exiting the Mouth of the Murray at Pomanda because of strong SW winds which forced him on the lee shore. The wind then swung to the NE allowing him to sail easily across the lake with eased sheets. And then after 2 nights the wind again swung to the SW (gale force) allowing him to quickly sail back across the Lake and up the Murray. Is this not exactly what we see today with the passage of fronts?